There are still a few decisions needed regarding tonight's line-up against the Devils but here's everything we know as we move towards puck drop in New Jersey. "I still have to wait until after warm-up. We've got three guys that we have to wait and see about," said head coach Guy Boucher regarding his line-up during today's media availability. "Depending on which guys can and can't go, I'll make decisions after the warm-up." The three players that Boucher is still waiting for updates on are Zack Smith, Chris Wideman and Alex Burrows. Smith, who was injured in last week's game against the Devils, had been targeting tonight for a potential return should his recovery continue to progress smoothly while Wideman and Burrows are each dealing with some minor injuries following last night's game against Philadelphia. In the wake of the rash of injuries early in the season, the Sens got some contributions from a pair of call-ups yesterday with Filip Chlapik and Chris DiDomenico each notching their first career NHL points in the Sens' 5-4 win. Another recent recall from Belleville could get his first taste of NHL action as Jack Rodewald waits to see if he'll be in the line-up tonight. "Here's the thing: I would really like to see him play," Boucher said of Rodewald. "The other guys have done fine so that's not the issue, it's just that he's here now. I'd really like to see him play because I liked him in camp a lot." Tweet from @Media_Sens: #Sens coach Boucher confirms Mike Condon starts in goal tonight. Lineup TBD after warm-up as a couple of players are game-time decisions. Lots of decisions still to be made and your guess is as good as mine at this point but as the coach shared, at least he's got options. "I'd love to give you what the line-up is," continued Boucher. "But there's option A, B and C...so that's where we're at." 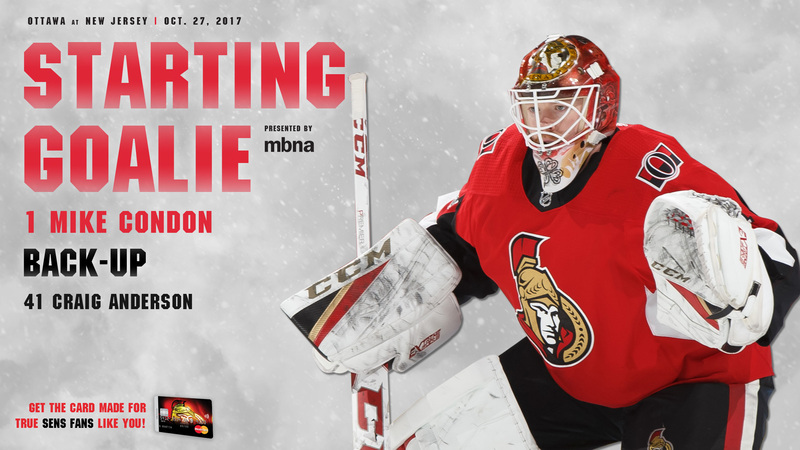 Mike Condon (1-0-1) gets set to make his third start of the season for the Sens. Besides a gaff behind the net against the Kings on Tuesday, Condon has been lights out for the Sens in his two previous appearances stopping 76 of the 79 total shots he's faced for a very stingy save percentage of .962 over that span. He has been equally good against New Jersey in his career as well and brings a 4-0-1 lifetime record versus New Jersey into tonight's game.